Oh hey, a Game Pile about a Commander Keen game! We’ve done that before! Twice! And right now, it’s amazingly actually timely, kind of, because unlike how I wrote about Wonder Boy 3 just in time for the announcement of the remake, I had this plan lined up just as Keen Dreams dropped on the Switch. Who was seeing that coming!? 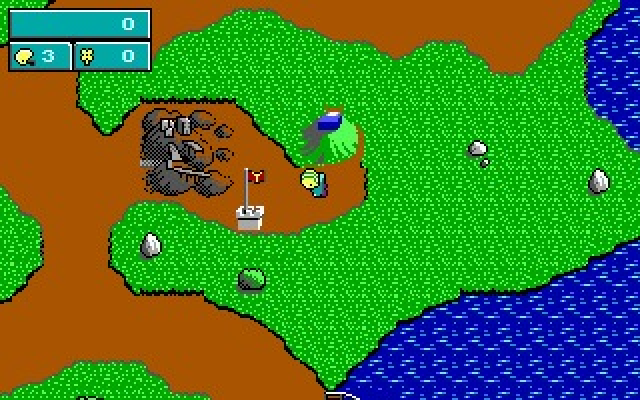 Released in 1991 under the Softdisk label, Keen Dreams marked a turning point in Commander Keen design. The first Keens were made as an exercise in smooth scrolling video on a PC – an attempt to replicate the movement of Mario Bros kind of games, and which wound up being – you know what, just go read Masters of Doom by David Kushner (no relation to that one) and learn about the arc that takes from Commander Keen and Softdisk to literally the entire modern landscape dominated by team-based multiplayer shooter games. Suffice to say this is legitimately one of the stepping stones on that path. If I was a fairer writer, I’d tak about Commander Keen 3: Keen Must Die!, and I guess, here, bonus Game Pile: Keen Must Die is an afterthought of a game and makes the moral weirdness I mentioned about Commander Keen 2 both front-and-centre and obvious. 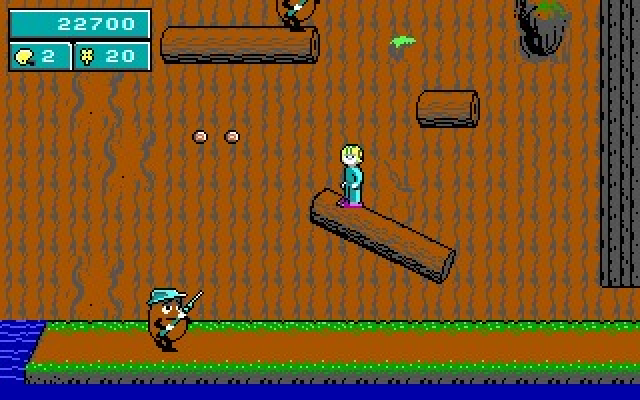 Like it’s pretty much impossible to finish Commander Keen 3 without shooting someone’s mum, which is pretty bleak as a story beat to put in a videogame. Keen Dreams is a… decent game. It’s fine. It’s alright. It’s definitely weaker than Keen 4 and a little bit better than Keen 3. There’s less game here than you’d think, less spectacle, less fun exploration, and there was a point where this game was entirely available for free, but it’s certainly worth more than nothing. There’s a bunch of interesting stuff about Keen Dreams. First there’s its weird existence as a non-id software Commander Keen game. The way it works is that id software, when it started, didn’t exist, like, as a company. Instead, id software was a bunch of dudes making games on their boss’ computers at their work, and when this was found out, that company, Softdisk, weren’t very happy. oh that happened, didn’t it? 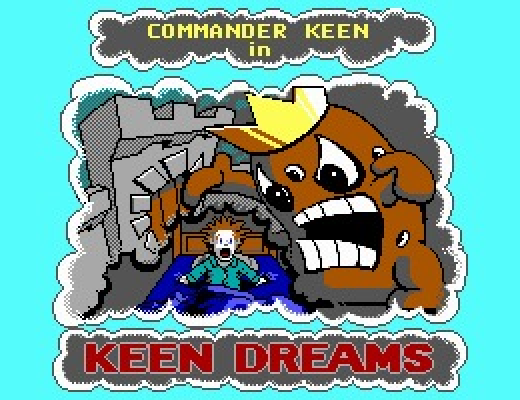 Anyway, the point is that Keen Dreams is definitely a Commander Keen game; it’s about Commander Keen, and it was the first of the VGA Keens. Now, the remaining three Keens (4, 5 and 6) use this base engine, but they have a very different style. They continue Keen’s adventures into space while Keen Dreams is focused instead on the story of Keen as a child. The first adventures were about getting up to something exciting when left to your own devices and your parents were out at dinner, or dealing with a school bully, and here, Keen Dreams is about not wanting to eat your vegetables and having a nightmare about being tormented by food you don’t like. The whole game has a lot of what I think of as Tom Hallness to it. There’s a really deliberate lightness to the whole thing. You huck seeds at enemy vegetables, which are out to get you, and they turn into flowers, and when you ‘die’ you don’t even do the classic wiggle-bounce that other Keen games do. You fall asleep. It’s just a gentle game, really. Which is weird that it has, built into it, one of the rarer things that a Commander Keen game can have: a failure state. The Commander Keen games are robust chunks of code. Partly because the engine was mostly dedicated to handling scrolling correctly rather than giving the developers a lot of room to play around, and partly because the whole thing was made to do fairly simple iterations on simple things, none of them are particularly prone to any weirdo glitches. There’s one or two – Commander Keen 5 has a way to mess with door loading and there’s a real dealbreaker of a glitch in Commander Keen 6 that makes the speedrun an utter joke, but in general, they’re not very buggy. Also, because each Keen game is designed as a sequence of levels you can do in almost any order, they’re also designed so it’s kind of hard to fail them. 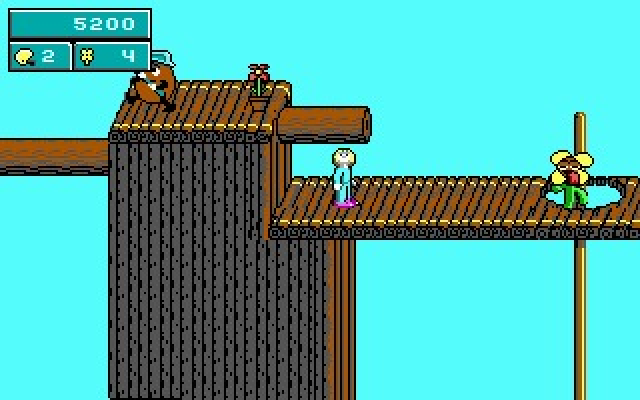 In Commander Keen 1, there’s a very easy-to-access pogo stick that makes the puzzles in the late game doable, and it’s possible to choose to skip it, and that’ll make the game unwinnable. In 2 and 3, it’s a lot harder to make the game unwinnable – the life system means you’re more likely to lose the game than you are to make the game safe and unfailable. In most of the games, those failure states are rare – usually right at the start. But in Keen Dreams, to kill the final boss, you need things called Boobus Bombs. Those bombs are scattered throughout the world in sets of three, and in a number of levels in hidden spots – you can finish those levels without getting the bombs. And that presents the possibility that you can finish levels without getting enough Boobus bombs and find yourself running around in a game world that cannot be finished. You could do this reasonably early, finishing four of those levels without getting the bombs, and you won’t know you can’t finish the game until you approach the end of the game and be told, no. It’s a byproduct of freedom. It’s a lesson that most of the subsequent Keen games avoided. It’s very possible in most Commander Keen games for you to fail the game. Miss a jump, time a shot wrong, prioritise the wrong enemy. But it’s interesting to notice the ways that in this game, it’s possible that the game fails you.